(Bloomberg) — Turkey’s central bank announced a surprise tightening of monetary policy and moved to calm concern over a sudden drop in official reserves in a failed attempt to stem a slump in the lira. The currency tumbled as much as 5.8 percent Friday as the central bank announced steps to push lenders toward its more-expensive overnight borrowing facility. It was 4.9 percent lower at 5.7457 per dollar as of 8:23 p.m. in Istanbul. A central bank official said late Friday that a drop in official reserves during the first two weeks of March wasn’t anything out of the ordinary, citing foreign-debt repayments and sales of hard currency to state energy companies. That statement came after the lira’s slump picked up pace amid speculation the decline in reserves signaled the central bank was using its holdings to prop up the currency before elections on March 31. A lack of clarity over policy direction after the election has seen the lira extend its declines over the past three months to more than 7 percent. The risk of a flare-up in tensions with the U.S. over Turkey’s plans to purchase a missile-defense system from Russia is also contributing. The central bank raised its benchmark interest rate by 625 basis points to 24 percent in September after the lira fell to a record low in August. Now it wants banks to use one of two more expensive funding windows, one which has an interest rate of 25.5 percent and another with a rate of 27 percent. The lira slump is being compounded by signs local investors are turning to foreign currencies amid runaway inflation that’s eating into lira savings. 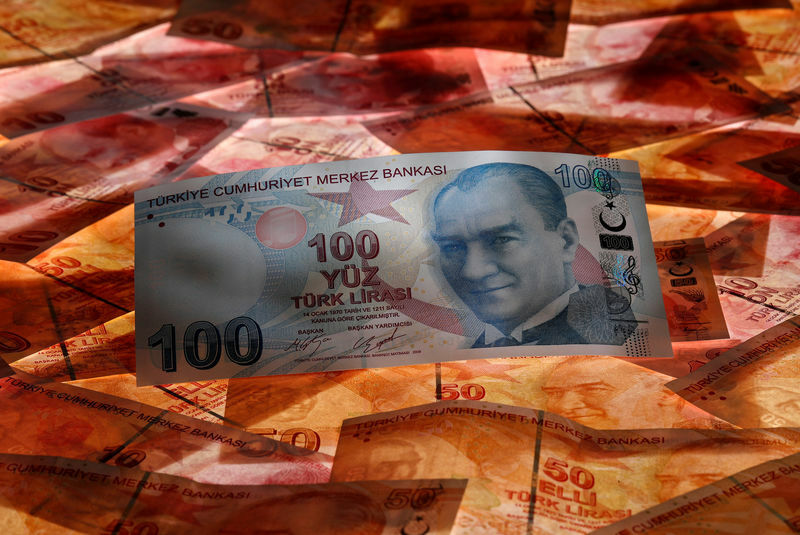 Turkish households and companies bought $4 billion of hard currency in the week ended March 15, the most since 2012, driving their holdings to $175.8 billion, a fresh record. The central bank’s net international reserves fell $6.3 billion in the two weeks through March 15 to $28.5 billion, according to data published Thursday. The erosion outstrips the Treasury’s $3.8 billion external debt payments scheduled for March and analysts are having trouble squaring the discrepancy. “Since external debt repayments can’t explain the decline in reserves, markets are assuming there is intervention going on,” Henrik Gullberg, a strategist at Nomura Plc. in London, said before the central bank statement. Still, a central bank official told Bloomberg that recent foreign debt repayments and foreign-exchange sales to state energy companies amounted to $5.3 billion. JPMorgan Chase & Co (NYSE:JPM). recommended investors go long on the dollar against the lira, targeting a move to 5.90. JPMorgan could only account for a $1.5 billion drawdown of reserves in the two weeks through March 15, which it attributed to the Treasury’s Eurobond redemption. It estimated reserves fell by another $1.5 billion as of March 20. The yield on benchmark government notes trimmed a surge to 59 basis points and the Borsa Istanbul 100 Index slumped by the most since August, led by the nation’s largest listed lenders.